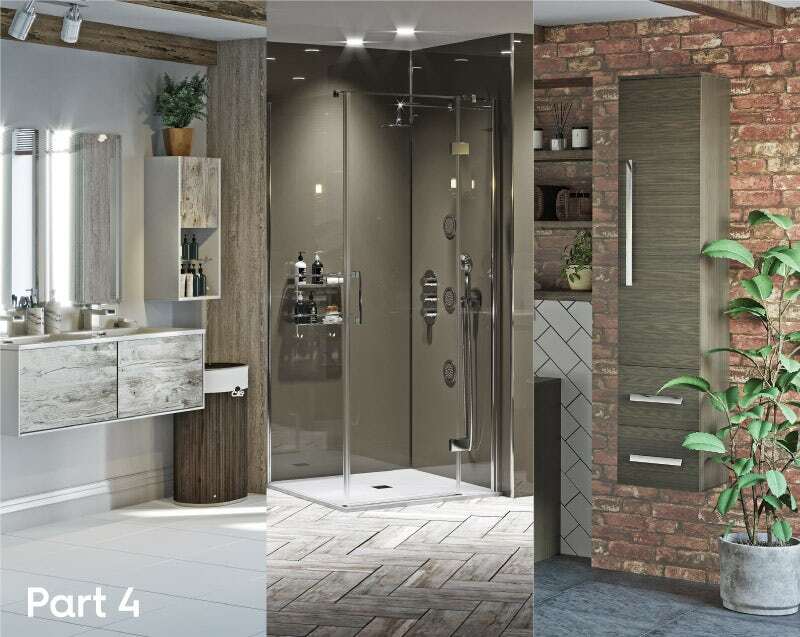 In part 3 of this 4-part style guide, I’ll show you how to design a bold bathroom with plenty of natural elements. 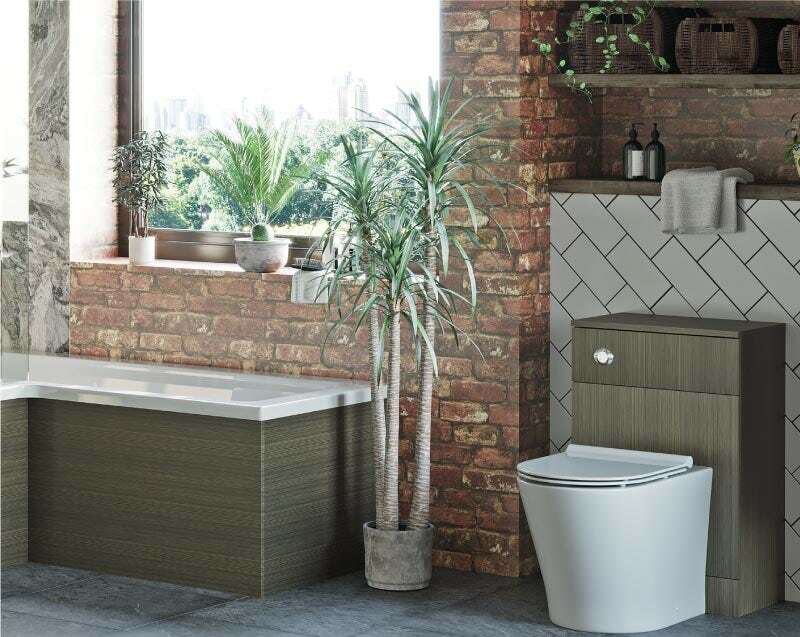 Reconnecting with nature is set to be one of the top bathroom trends in 2019, with many of us aiming to create a more organic look and feel. Whether this is through the use of authentic natural materials or manmade products which replicate the appearance of stone, wood, brick, slate and marble, it will certainly come as a tonic to those who are tired of austere, minimalist style décor. In this article, I’ll show you how to produce a bolder, more colourful look, with contrasting surfaces and textures. Blurring the boundaries between outdoors and indoors is a trend that is set to be around for a good while to come. 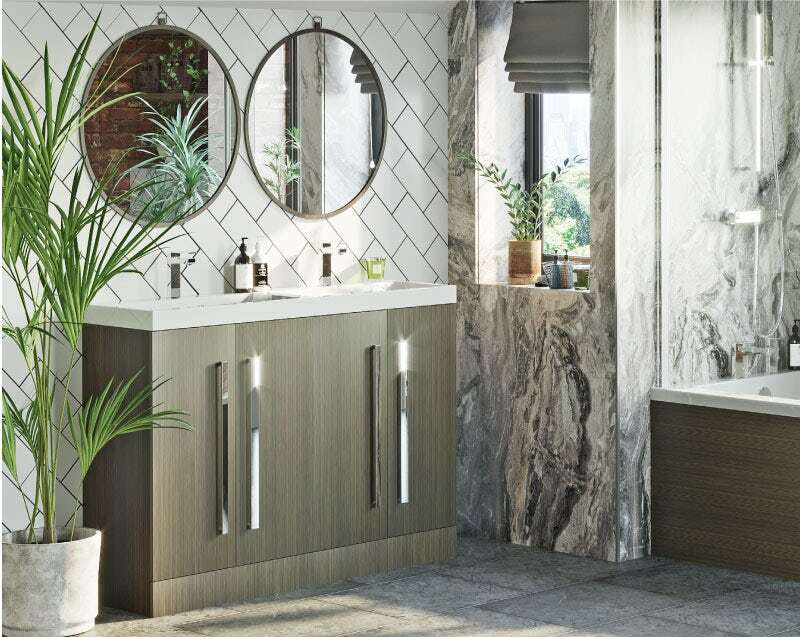 With our latest Natural Elements bathroom, we’re taking the organic look a step further, through the use of greenery and wood finishes, coupled with a range of contrasting materials which give the appearance of natural stone. See my mood board below and you’ll start to get a feel for this bathroom. The look is contemporary in its design, with plenty of clean, straight edges, simple shapes and unfussy accessories. 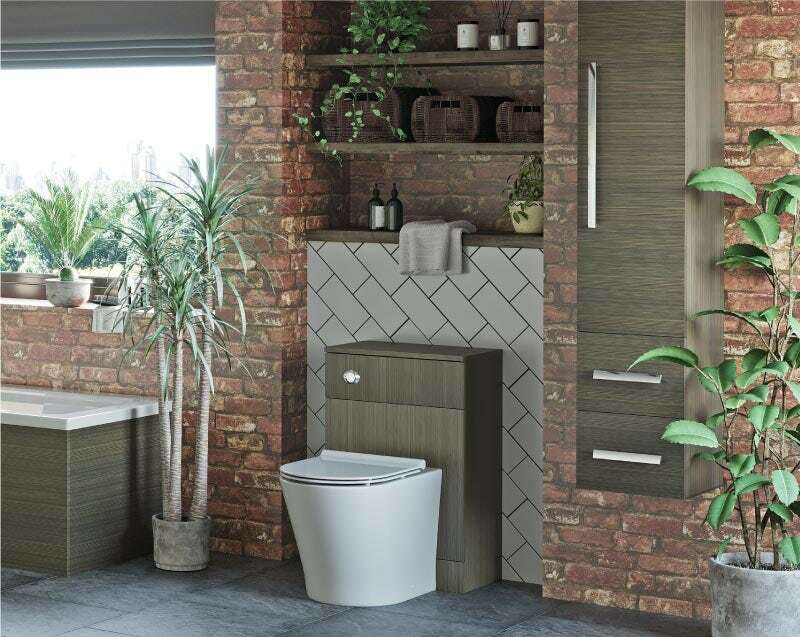 As with many contemporary bathrooms, there is a genuine balance between form and function with no need for bright, unnatural colours or textures. At the same time, the look is homely, warm, inviting and eclectic, producing a harmonised yet contrasting experience. If you like this look and wish to replicate it in your own bathroom, here are my own tips and advice on how to easily achieve this. Instead of spending thousands on genuine materials, you can create the natural look with a range of manmade wall and floor coverings. Wallpaper, can be a great low cost option, especially if you’re working to a tight budget. In our room set, we used a brick effect wallpaper to create the illusion of a weathered brick wall. Just remember to use a washable wallpaper suitable for use in bathrooms, or you may end up having to replace it sooner, rather than later. Around the shower area we produced a marble effect with shower wall panels. Quick and easy to fit, and a fraction of the cost of the real thing, simply cut to the desired shape and apply to the wall with specialist adhesive. Finally, on the floor, we used slate effect tiles. These are hardwearing, made from ceramic, easy to clean and, more importantly, cost far less than this expensive material. Walnut is an excellent wood finish if you fancy something darker yet more natural in its appearance. As with stone, the real thing can be quite expensive and will require plenty of maintenance, which is why engineered wood is the perfect alternative. With excellent resistance to moisture, engineered wood is ideal for bathrooms and can be easily shaped into all manner of furniture units. Mahogany, red oak and cherry are other popular dark wood finishes that give a more organic look. To continue the dark wood theme right around your bathroom, why not add a matching back to wall toilet unit and bath panels, like we have? Add greenery to your room design with a variety of pot plants, including larger plants placed in pots on the floor and smaller plants dotted about your surfaces. If you don’t have any shelf space, you could even add hanging baskets, a living wall or you could even make your own terrarium. 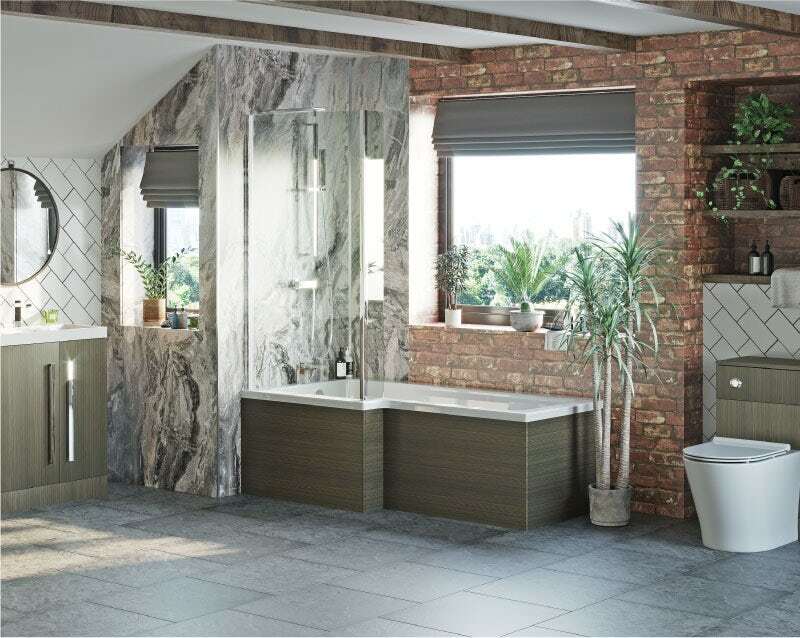 Boston Ferns, Kentia Palms, Spider Plants and Aloe Vera are all ideal for use in bathrooms and thrive in the warm humid atmosphere, producing a bathroom design that is almost tropical. Love the look? 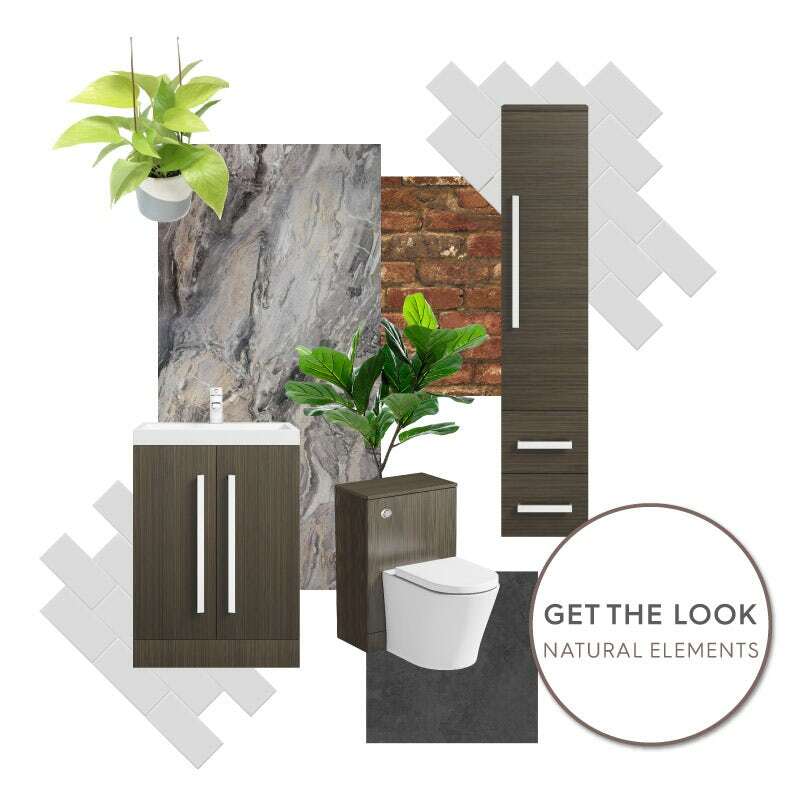 Why not browse all the items used in our Natural Elements bathrooms by clicking on the image below. Now you’ve seen all the rooms, discover which products we used and why in part 4, by clicking on the image below.